Albion Area Public Library acquires, organizes, and provides open access to information, resources, and services that inspire and help community residents meet their lifelong personal, educational, cultural, vocational, recreational, and professional information needs. The Library, as a leading force in the community, emphasizes local resources, popular materials, and educational enrichment for all ages and abilities. 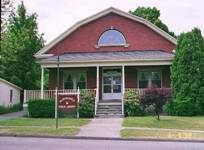 Housed in the former rest house of the Bessemer and Lake Erie Railroad, the Albion Area Public Library offers a variety of services to patrons of all ages. In addition to a collection of fiction and non-fiction books on virtually every subject, visitors will find an impressive children’s library on the lower level. The history room houses a collection of records and information about local people, places, businesses, and organizations. Internet service is available at the library, also. Librarians Patti Bowersox, Sandy Case and Jenni Pavolko are always ready to help patrons find whatever reading material they need. *The Library is partnered with Goodsearch.org and Goodshop.com. Use Goodsearch for all your searching needs and earn the library a penny for every search, and use Goodshop every time to shop online, from Amazon to Walmart, to earn the library a percentage of the total- at no cost to you! Sign up now!